This review of 43 impact studies sought to methodically capture the known impacts of economic strengthening (ES) programs (microcredit, skills training, agricultural interventions, etc.) 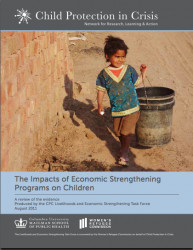 on the well-being of children (0-18 years) in crisis contexts in low-income countries. The review looked at effects on children from interventions engaging caregivers as beneficiaries compared to those targeting children themselves. The goals were to understand the types of approaches taken to economic strengthening that focus on improving children’s welfare, catalog the interventions that have been rigorously evaluated for their impacts on children, and synthesize the evidence to identify the gaps in knowledge.